Trouble between the North and the South over the issue of slavery had been brewing for over 50 years, but finally exploded in 1860 when Abraham Lincoln was elected President. Seven Southern states left the Union, forming a new country. Fort Sumter, a fort controlled by the Union, sat on an island in the Charleston, South Carolina harbor. When soldiers here asked the federal government to send more men and supplies, Confederate militia decided that the fort was a threat. Confederate militia opened fire on the fort. The next day, the Federal soldiers surrendered and left the fort. The Confederates took the fort. No men were killed in the skirmish, but the Civil War had begun! In 1860, the Republican party chose Abraham Lincoln as their presidential candidate. Abraham Lincoln was against allowing slavery to expand into new territories, but also wanted to keep the Union intact. His campaign focused on building a railroad across the country, as well as a homestead law that would encourage settlers to buy and farm land. The Democratic party was in conflict. Northern Democrats wanted Stephen Douglas, who thought states should be allowed to choose whether to allow slavery, as their candidate. Southern Democrats wanted pro-slavery candidate John C. Breckinridge. Abraham Lincoln narrowly won the election. Southern states had warned that they would leave the Union (secede) if an anti-slavery President was elected. Most Northerners thought they were bluffing. But in December, 1860, shortly after Lincoln was elected President, lawmakers in South Carolina unanimously voted to secede. Alabama, Florida, Georgia, Louisiana, Mississippi, and Texas soon left too. These states formed the Confederate States of America. They elected Jefferson Davis as president and even wrote a new constitution and created a new flag. Not all Southern states seceded. Delaware voted unanimously to stay in the Union. Kentucky, Maryland, Missouri were fiercely divided. In Virginia, six western counties broke off from the state to form West Virginia, a Union state, while Virginia became a Confederate border state. Visit Scholastic to learn more about the Civil War. Declan, Tobin. " 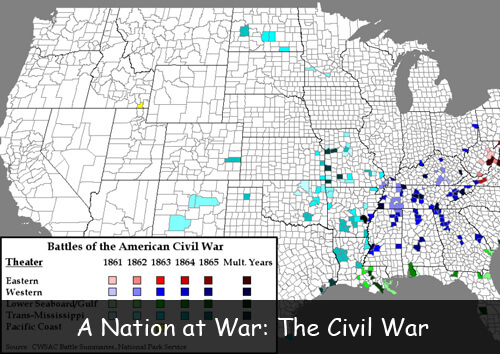 American Civil War Facts for Kids - North Versus South ." American History for Kids, Apr 2019. Web. 21 Apr 2019. < https://www.americanhistoryforkids.com/nation-war-civil-war/ >.